40 under-aged cadres of the Liberation Tigers of Tamil Eelam (LTTE) were released to UNICEF at the LTTE political office in Sampoor, Trincomalee today, UNICEF officials said. Special committee appointed by the LTTE to review an under-age list submitted to them by the UNICEF made the determination that the released 31 girls and 9 boys joined the LTTE using false documentation saying that they were 18 or older. Thilak, LTTE's Trincomalee district political head, Mr. Bavananthan, Deputy Director General of the LTTE Peace Secretariat and Mr. Thiyagarajah, the NGO Co-ordinator of the LTTE participated in the handing over event on behalf of the LTTE. Ms.Gabarilla Elroy, representative of UNICEF for Trincomalee, Patrik Haulden, the representative of the ICRC for Trincomalee, also participated in this meeting. 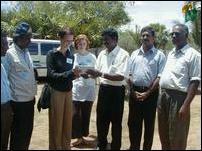 Mr. M.Thiagarajah (Pavarasan), UN agencies and International NGO's Co-ordinator of the LTTE political secretariat handed over the documents of the released cadres to Ms Gabriela Elroy. At the commencement Ms Gabriela Elroy thanked the LTTE for releasing under-aged cadres and said UNICEF would take immediate steps to hand over the under-aged cadres to their parents. "Mr. Thilak emphasized that the UNICEF has the responsibility in preventing these under-aged children rejoining with the LTTE by addressing their immediate needs such as education, poverty alleviation," LTTE peace secretariat website said. TRO Trincomalee District Director Mr.K.Mathavarajah also spoke. 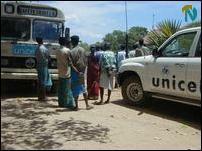 The UNICEF officials took the released LTTE under-aged cadres in a bus to an unannounced destination from where they would be handed over to their parents, UNICEF officials said. ( L-R) TRO Trincomalee Project Officer Mr.V.Kalaivarnan, Mr/C.Kumarakuruparan, member of the TRO Board in Trincomalee, TRO Trincomalee Director Mr.K.mathavarajah, Mr. Thiagarajah, NGO's co-ordinator of the LTTE and Mr.Thilak, Trincomalee district political head.